In 2011, Tory ran the ING New York Marathon!!!! The biggest marathon in the world. 120,000 people apply to run the five bridges and five boroughs race. 49,000 get in. Thanks to her partnership with the Jodi Lee Foundation, she was one of those 49,000. She ran from Staten Island, through Brooklyn and Queens, into Manhatten, through the Bronx, back to Manhatten and finished in Central Park, 42.195 km later. She didn't walk. She promised us that 2 years ago. She raised almost $11 000 for the Jodi Lee Foundation to help them promote Bowel Cancer awareness, screening, education and research. She did her screening test - have you done yours? It's easy, painless, quick, cheap, and not as gross as you'd think. Do it today. And once a year from when you turn 40. Although Tory was not yet 40, this learning to run caper did grow on her. She is inspiring patients and colleagues at work to run, and Facebook friends are setting goals and achieving them. They are all losing weight, getting fitter, and finding a happiness in being fitter. 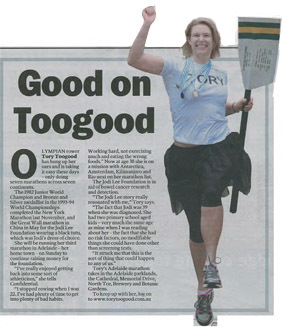 Tory's goal now, in 2014, is to continue to run a marathon on each of the 7 continents. North America was first. China and the Great Wall will happened in May 2012. August 2012 saw the home town marathon - Adelaide - for continent #3. 2013 saw Africa with the Kilimanjaro marathon in March, and Amsterdam was continent #5 in Europe in October 2013. 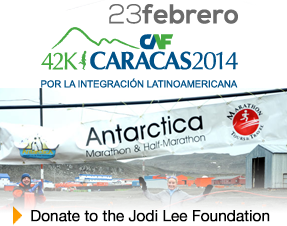 March 2014 - confirmed for Antarctica, with a challenging double created by entering the Caracas marathon in Venezuela (South America) only 2 weeks beforehand in February 2014. These trips and adventures are entirely self funded. But she is continuing to support the Jodi Lee Foundation, and raise awareness for bowel cancer screening. And that is where you can help. Follow the screening links and order a test for yourself, for you partner. Consider a workplace screening drive. The Jodi Lee Foundation can help you with more information. And consider donating to the foundation so they can continue their work. Your tax deductible donation is easy to do. Click on the link, which will take you directly to the Jodi Lee Foundation site and their secure server for a credit card donation. You will receive a tax deductible receipt in your name, and your donation goes directly to the Foundation. It is merely marked against Tory’s name, so the Foundation can track how much is donated by her and her supporters. Click on this link to donate by then pressing the 'donate now' button.